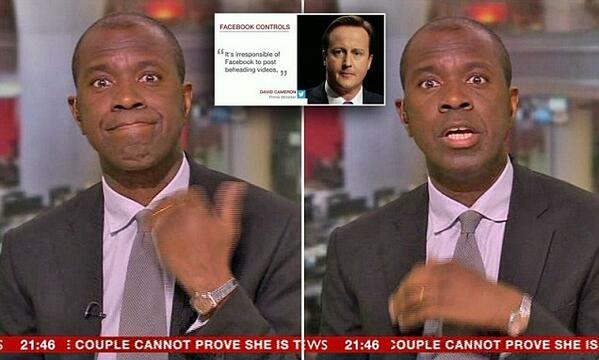 BBC News anchor Clive Myrie was caught making an awkward hand gesture last night. During a BBC News report on Facebook allowing beheading videos Tuesday night, anchor Clive Myrie was caught making a rather awkward hand gesture. Myrie made the "cut" gesture after accidentally saying the word "patients" instead of "parents" while reading out David Cameron's tweet. @clivemyriebbc Ooohhh unlucky! Camera cut back to you just as you were doing the "kill" gesture during a beheading story. BBC blunder as presenter is seen making cutting gesture while talking about vile beheading videos on Facebook - Doh! Neither Myrie or the BBC have commented on the gesture.